I need some fireplace help. 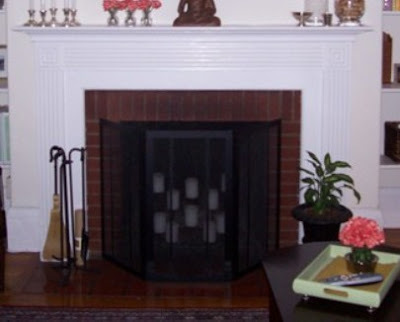 I hate the brick in my fireplace and wish I owned the place so I could change it. But, I'm a renter and those type of changes are not allowed. So, anyone have some ideas on what I could use to cover the brick without making permanent changes?? I know when I need ideas, I browse HGTV or something similar for inspiration. If you are artistic, you could build or acquire a wooden frame of sorts, stretch an already printed canvas (or paint your own) and use it as a cover up for the bricks.